The Fiat Dino should not be confused with the Dino 206/246 -- although they both share the same compact Ferrari Dino V6 powerplant. The Dino 206/246 is a mid engine classic that costs as much as a beachfront cottage (you pick the locale...) while a Fiat Dino will cost you a swampfront cottage...or less if you find one that has been stored in an actual swamp. 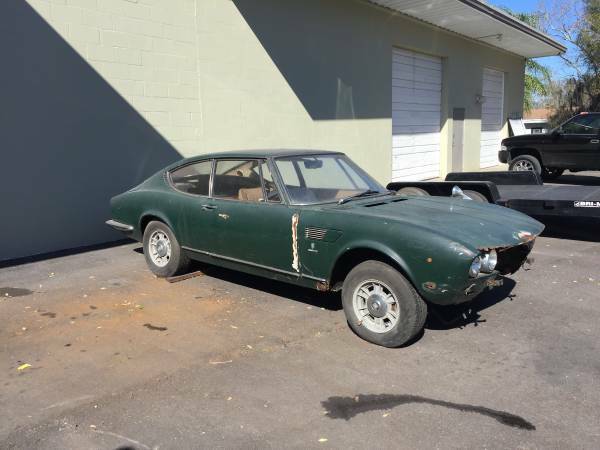 Find this 1968 Fiat Dino Project in Clearwater, FL via craigslist for "make offer". Tip from Davery. 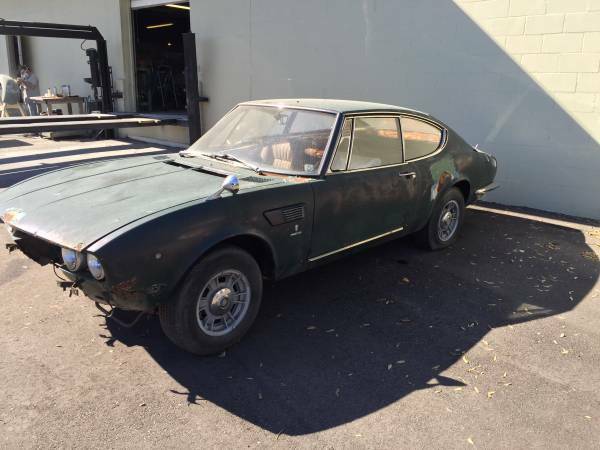 This Dino is offered sans engine or transmission, but it appears to have suspension, interior and glass -- perhaps it just needs a creative engine transplant to get back on the road? What about a Pentastar V6 from a Chrysler 300/Jeep Wranger? You might think this a strange swap until you remember that Fiat owns a majority share of Chrysler, so this is an in-the-family swap with the same number of cylinders. Seems like a no brainer. Looks like a decent engine, what's the bellhousing pattern fit? This looks like it has been ridden even harder and put away wetter than the last ad. Has it hit rock bottom? A good friend of mine owned one for about 10 years, so I always make a mental note when I see one for sale. He sold his about 10 years ago and missed the recent run-up in collector car prices unfortunately. His was a 2L, I had a chance to drive it a couple of times, what a wonderful engine - great noise and loved to rev all the way to redline. Molto bella. Loving all the Florida love, guys. Remember when these could be had for a poorly whistled "One Note Samba"? Perhaps a bit more review is necessary. Nice Fiat Dinomspiders regularly trade hands at $200,000+. Nice coupes about 1/2 that. This car is junk. Structural rust that is expensive to set straight. You'd never get it right. Alfa 3.0-liter V6 swap. How hard could it be? You know, minus the rest of the everything this car needs.